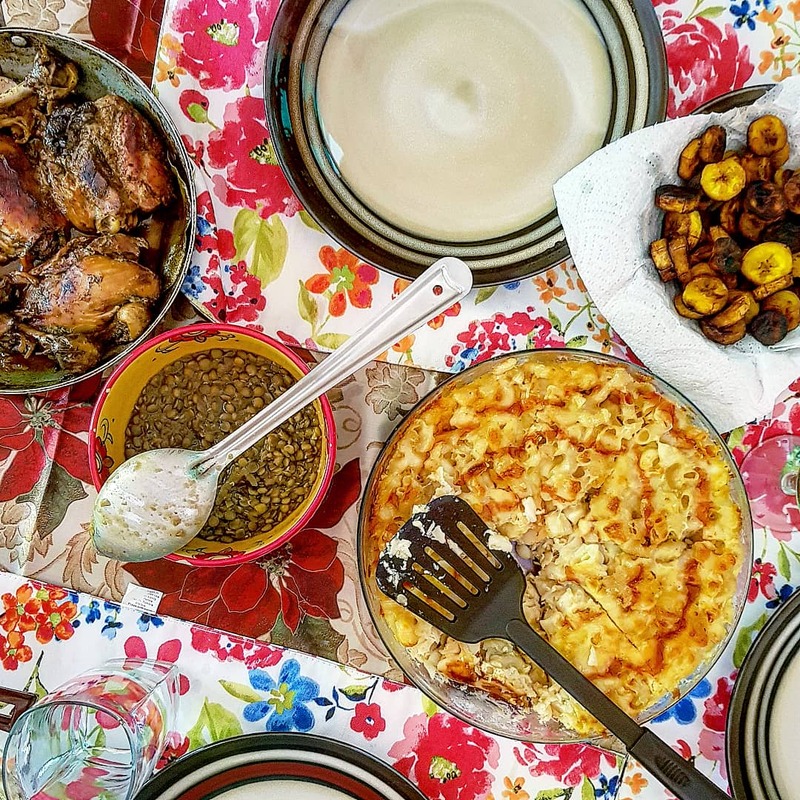 St. Lucian food is hugely under-represented in the Caribbean cuisine we get here in the UK. We get plenty of Jamaican restaurants feat. things like jerk chicken, curry goat and ackee & saltfish. 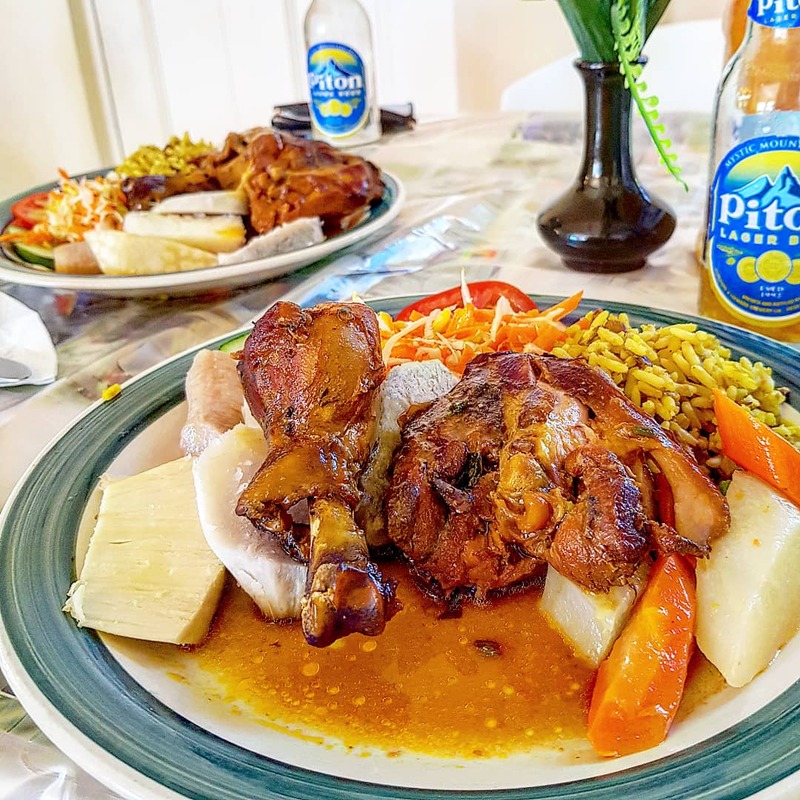 We do even see foods which are synonymous among other islands like Barbados, such as rice’n’peas, fishcakes and sweet bread. But have you heard of, or seen, Creole on any menus? In fact, there’s a total of 10 restaurants listed on TripAdvisor stating they offer creole cuisine. However only the odd one has just one solo item on the menu, such as The Blue Kitchen Creole Bean Burger. And that’s it. Proof. We don’t see enough of it over here. 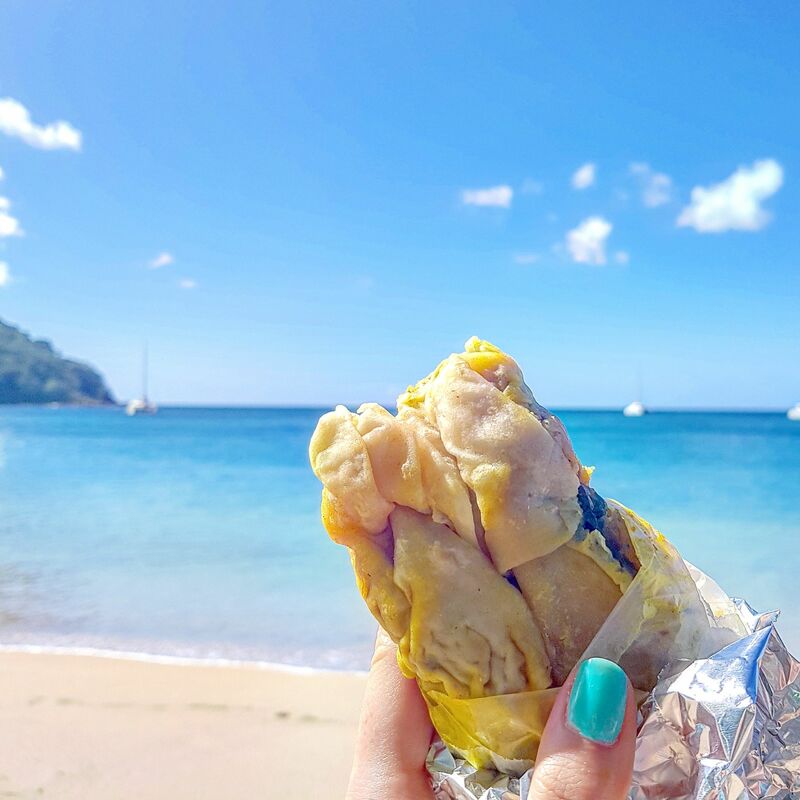 I fell in love with the food in St Lucia. 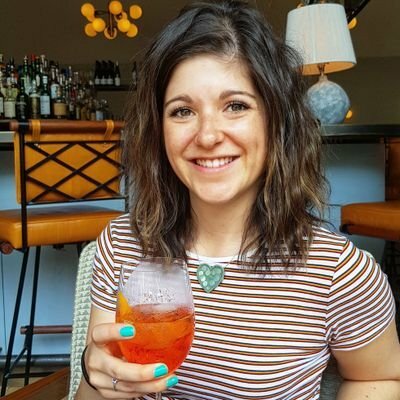 Well and truly head over heels. 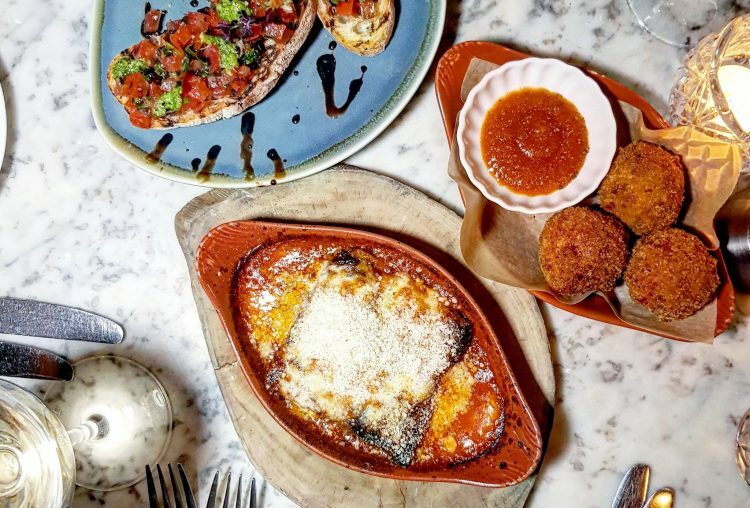 So if you’re planning a trip soon (…well this might make you want to), here are THE foods you have to try out there. This well and truly tops rotisserie chicken, which is my fave thing over here in the UK. The chicken is super succulent from slow cooking with a slightly crisp skin. The rich, seriously delicious flavour made from paprika, cayenne pepper, herbs and more, can be tasted even in the middle of each chicken piece, due to the time it’s spent marinating. It’s one dreamy centre piece to a meal. Finished with rice and veg/salad, it’s pretty healthy too. I could definitely live on this! 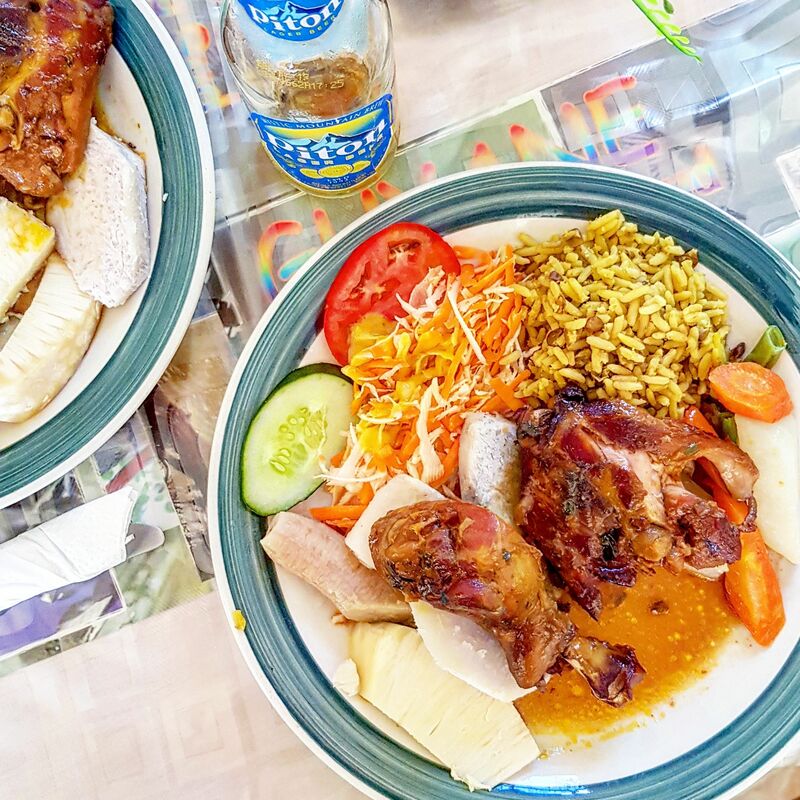 Febo’s in Soufrière, which was a recommendation by our Real St Lucia Tours guide Isaac, served an amazing Creole chicken dish for about £5! A fab little hidden spot. This has a lighter taste, as not to overpower the delicate fish flavour. 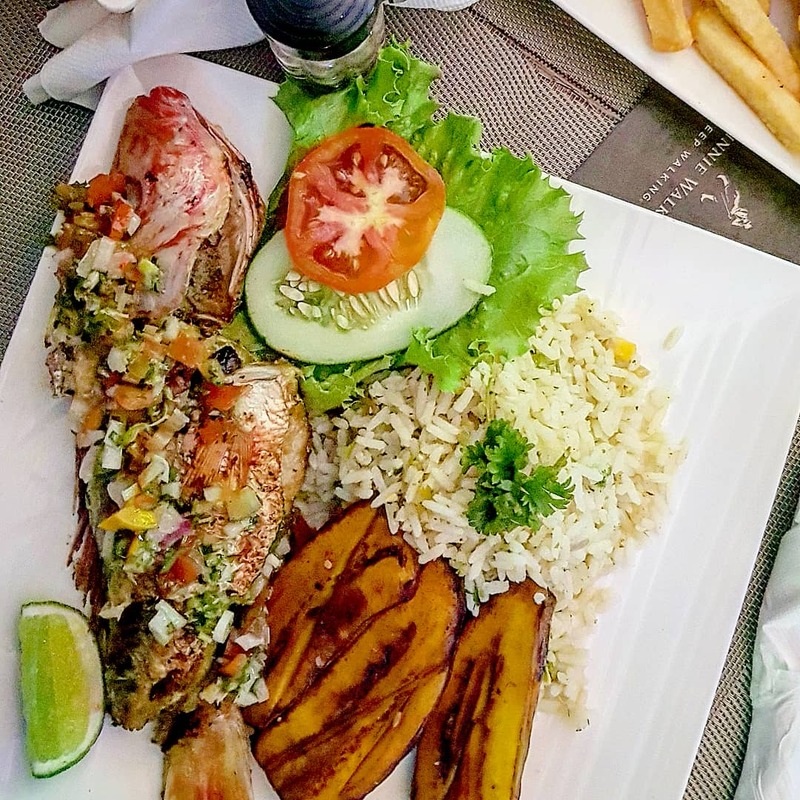 The one-pot fish dish I had at Zeebee’s sports bar in Rodney Bay (the spot which quickly became our go-to cocktail stop), was lightly grilled to keep the fish soft and tender, with a slightly smokier top coat. It was topped with a herby drizzle, a bit like a light pesto, and fresh peppers and onion. It was one beautiful dish (although there were many bones to navigate through), with just the right bursts of flavour. Fantastic with rice and plantain. The fish of the day, Dorado, was meatier and served with the same fresh drizzle and veg atop. Our meal at Keebee’s cost equivalent of £37.31 for two mains, two cocktails and two beers, which is much cheaper than here in the UK. 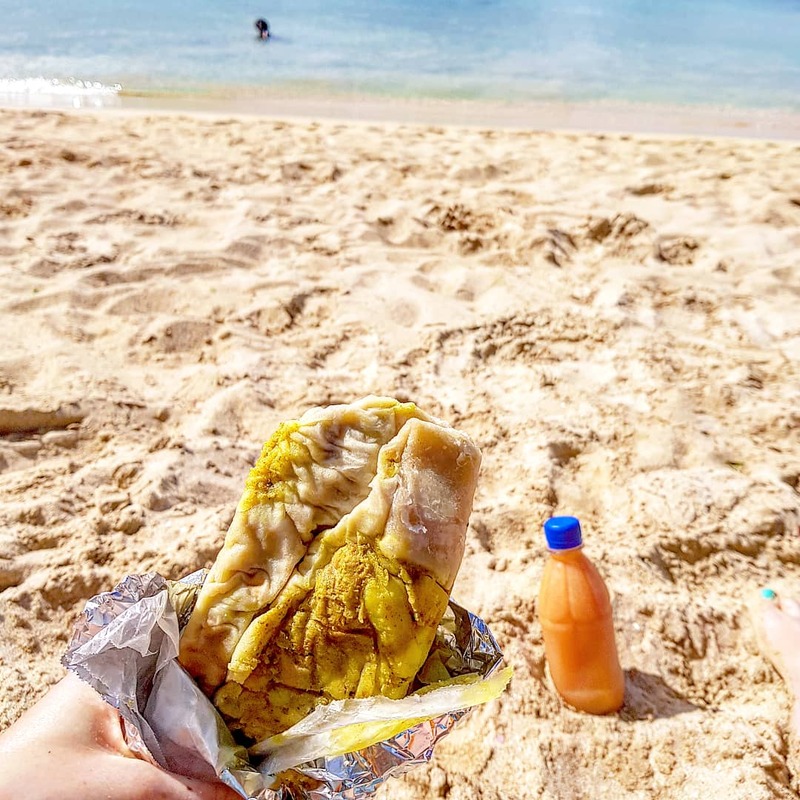 Roti – These I miss the most. 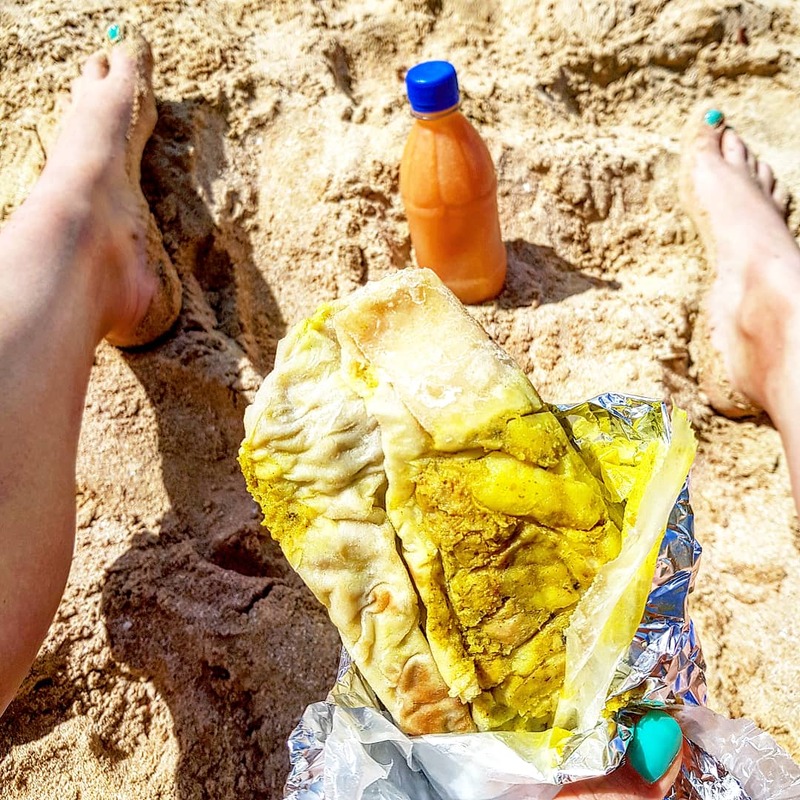 A roti is a typical West Indian flat bread filled with curried, spiced ingredients, from chicken to shrimp or vegetables. The flat bread is super thin, and the fillings are packed with flavour. We had three whilst away for 12 days…and I could have had many more! Both the veggie and the chicken I had hit the spot. The shrimp one Chris had was awesome too! At between $15 and $20EC (approx. £4.30 – £5.70), they’re not too bad for the price, but also how bludy good they are! Tip: Go to Liz Roti. Hers are the best – they’re bigger too. Chris said it’s the one thing he misses too and they really don’t do right over here, which I’m very sad about. Not sure I can wait that long before having another! Breadfruit is a strange one at first. It’s almost like a creamier, fluffier potato. It’s pretty mild in flavour, but adds a lighter starch to the meal. Great with the Creole style chicken! This is a must with everything. I absolutely love plantain. And the only reason I don’t miss it, is because I cook it myself here too. Grilled or fried, it’s absolutely delicious. Some restaurants will serve it sweeter than others (and personally I sometimes cook mine with a little cinnamon), but either way it’s really tasty. I much prefer this over the harder, almost fluffy texture of boiled green banana. You know like when an apple is a little cotton-y?! Although Chris actually prefers green banana, saying it finishes a meal – so do try if you get the chance! Cassava bread is made from ground cassava, which is starchy root vegetable or tuber with a nutty taste. The bread itself is very dense, but relatively moist. It’s like a more dense version of banana cake. The texture is a little more chewy too, it actually reminded me of that of coconuts at times. The flavour of the cinnamon one however was super tasty, mild yet delicious. It makes a great breakfast or part of lunch – but be warned it’s super filling. I only had half each time, but this always makes them pretty cheap. I got mine for about $8EC in the supermarket, which is roughly £2.30. I had never heard of these before. They’re a pear shaped vegetable which can come spiky. They have a tough skin, but the dewy flesh inside is the stuff you eat. When boiled up it doesn’t have loads of flavour, but it’s a really juicy vegetable so makes a great addition to any meal! Prices vary, but you can get most, if not all, vegetables at the market in Castries too where they might be a little cheaper. We actually had a small bottle of this from Liz, to enjoy alongside her rotis. It was almost like a slush consistency, nice and cold. Perfect for a hot day on the beach. As for the flavour, it’s very sweet tropical juice and absolutely delicious. Definitely worth the $10EC (about £3). Bounty is a lucian, almost dark, rum. It’s super smooth, delicious. Beautiful with a chilled tropical juice. But great with coca cola too. 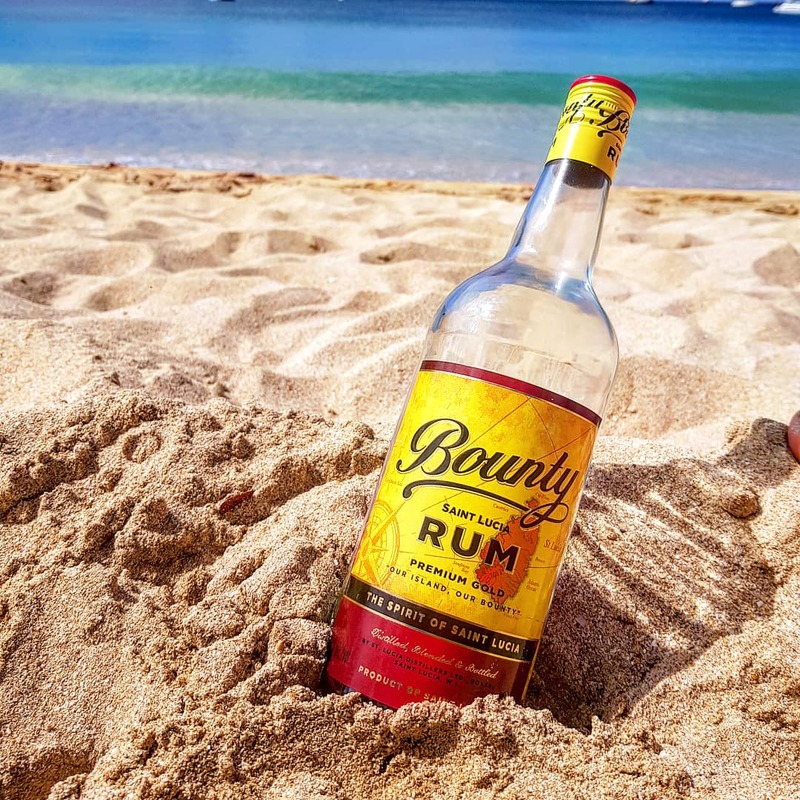 We drank quite a bit of Bounty on holiday, and love it so much we brought a bottle back too – for the odd occasion where we want to go back to the day we drank and laughed the afternoon away on the beach. The ultimate afternoon. It’s super cheap too from the supermarket – our 700ml bottle cost $25.99EC which is about £7.40! 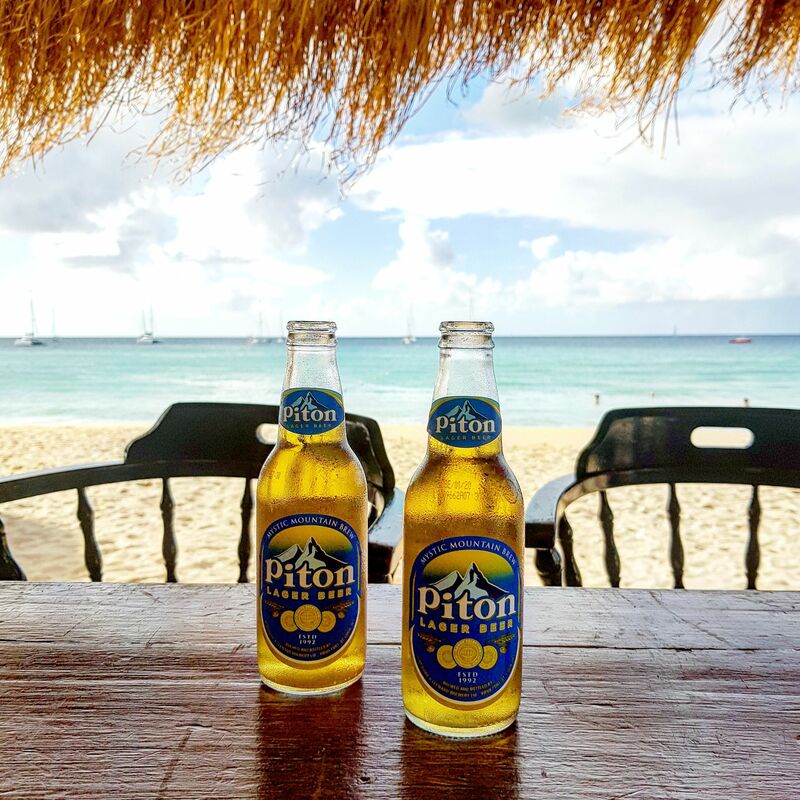 Piton is the local brew. It’s light, almost like a sol or corona but without the citrus edge. It’s not overly hoppy, and it’s super tasty and refreshing. I definitely could have drank more of these too! Prices varied dependent on bar or supermarket, but pretty cheap as it’s a local product. This is nothing like the coconut water you get here in the UK. It’s smooth (not bitty), it’s refreshing and delicious! 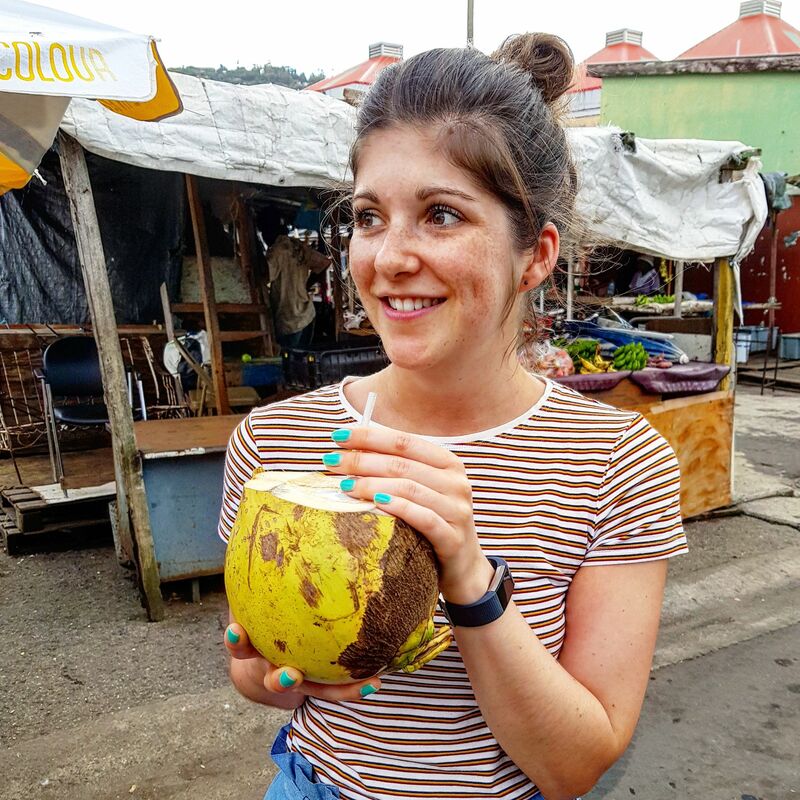 Plus it feels cool drinking from the actually coconut 😉 At only $2EC from the market in Castries (roughly 57p), it’s a bargain! Definitely a must-try! I’m hoping we’ll get to go back soon – but I’m already craving half of this to be back in my diet. I’ve requested we try make more at home. I just need to learn/practice a few bits, but keep your eyes peeled on my Instagram for more on this.. 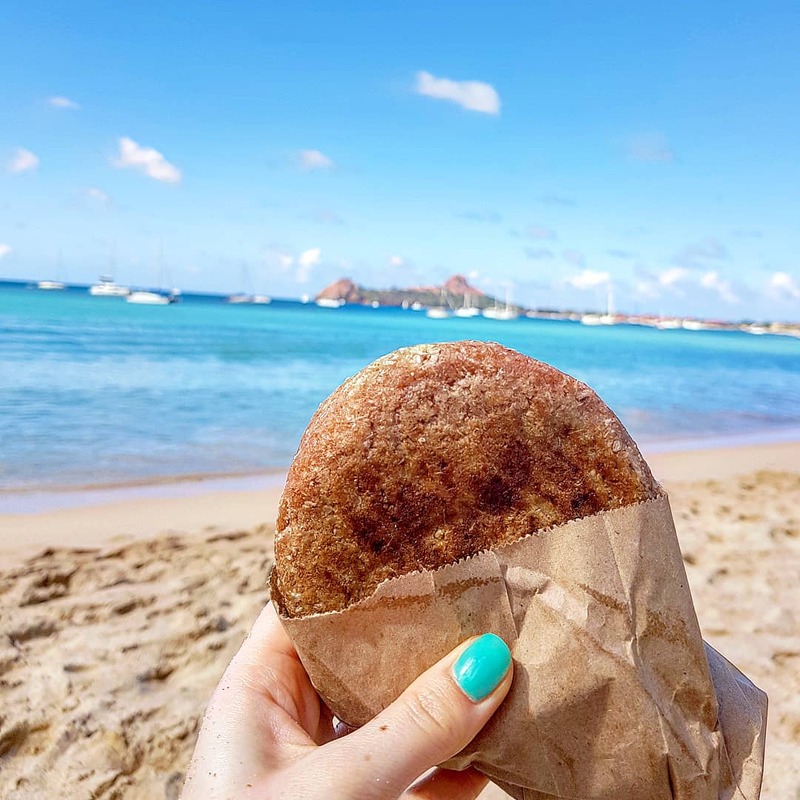 Which of your holidays or trips has been the BEST for food? 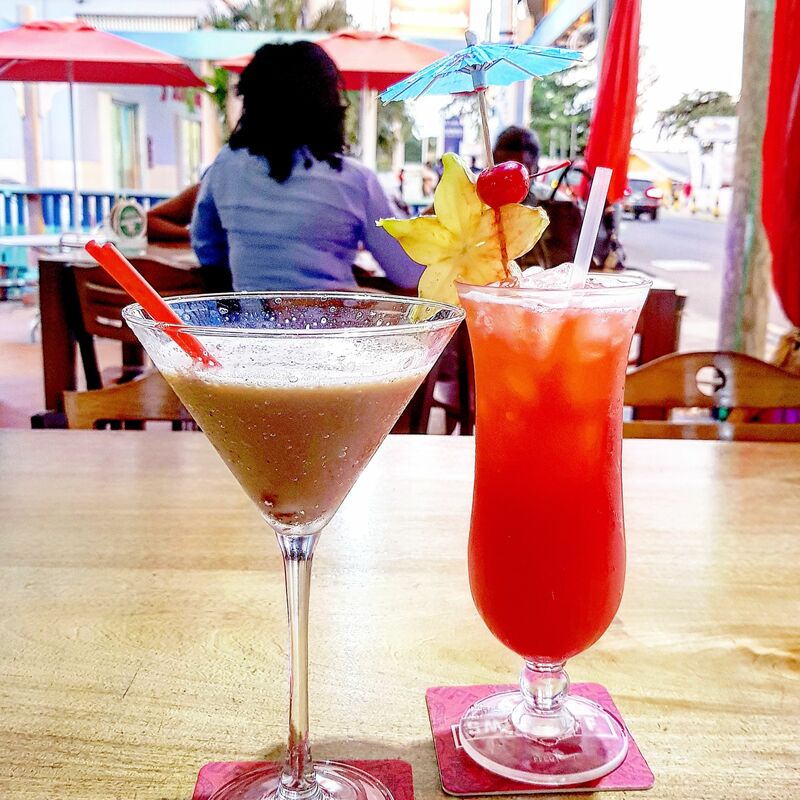 Ever considered St. Lucia before?